This old time perennial favourite really belongs in every garden. So easy to grow and the flowers are irresistibly cute! Dicentra spectabilis features graceful, soft green foliage that is less deeply divided than most other Dicentra species. 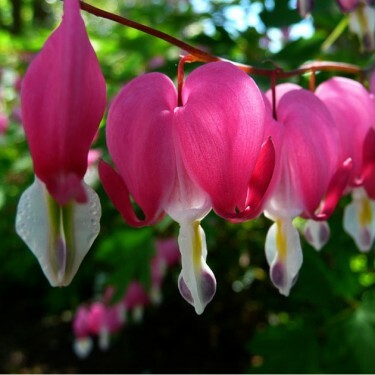 It also features nodding, rose-pink, heart-shaped, flowers with protruding white inner petals. The common name is in reference to the protruding inner petals of the heart-shaped flower which purportedly give the appearance of a 'bleeding heart'. For best effect, grow in part shade and provide regular water. Plants will go dormant if allowed to go dry, but will return the following spring. 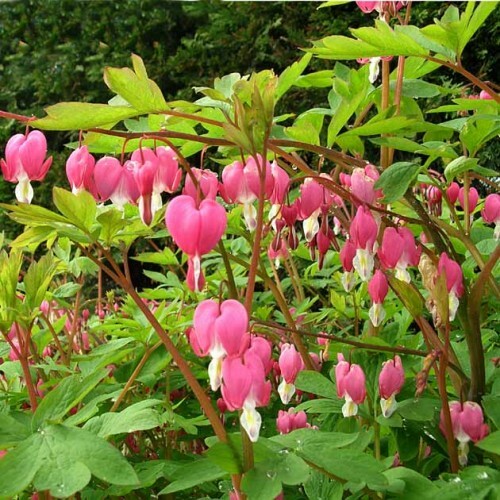 Planted with other shade lovers such as ferns, hostas and hellebores it will add charming beauty with little fuss or care.